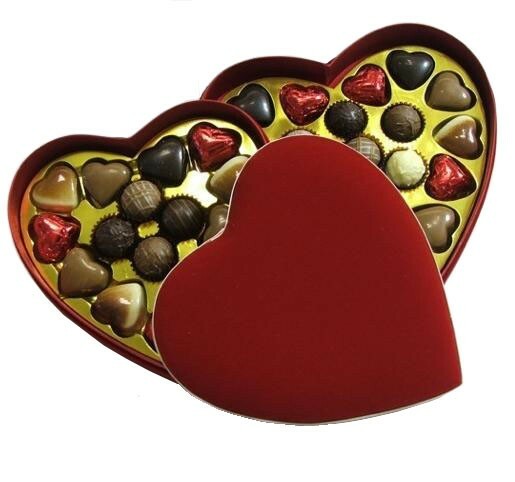 A very smart Red Plush Heart shaped box filled with a selection of Dumon Valentine chocolate hearts and assorted finest Belgian Truffles. This is a very smart and distinctive selection not available elsewhere. A very smart Red Plush Heart shaped box filled with a selection of Dumon Valentine chocolate hearts and assorted finest Swiss Truffles. This is a very smart and distinctive selection not available elsewhere. This says very clearly "I Love You!" Please note: The picture shows two boxes. There is one layer per box.